Best articles about How does the friends page work. HOW DOES THE FRIENDS PAGE WORK? Each profile existing on Libertinus can become your friend in our service. 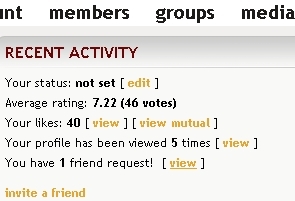 If you want to invite user to become your friend, first you need to find an account you are interested in and click it to see profile information. On the left side of your screen window "ACTIONS" will be displayed. Read the list of options until you find "add to friends" (check picture on the left). When you click the link, a friend request is send to the chosen profile. After accepting your request profile will be automatically added to your friends list (check picture on the right). Unless you choose option “hide friends” in settings of your account, the profile you invited, will be displayed on your profile as friend and vice versa. From now on in the members section you will see some additional information abut your friend's activity such as: friend’s events, comments, status changes, added pictures, uploaded videos and audio etc. You can check which of your friends are online, you have an easy access to the profiles of all your friends, and you are able to grant your friends access to your chosen private albums. You can decide which of pictures should be visible to your friends, so that you do not have to grant access to your album one by one to each of your friends separately. To see all your friends click link “friends” in the community drop down menu (check picture on the right). A list of all your friends will be displayed. This list includes basic information about your friends, such as: username, age, last activity online and date, when profile was added to friends. The list enables you fast and efficient way of contacting your friends. You can do this simply by clicking the link “send message”. Like this you can send e-mails to your friends without even entering their profiles! Removing profiles from your friends is very simple. To do this first of all go to your friends. 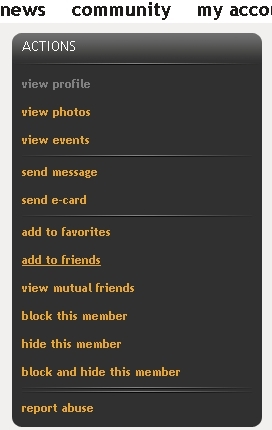 From the list of profiles choose the one you want to remove and click “remove from friends”. Removing somebody from friends, does not require confirmation from the other profile. If you want to try out this feature, please log in.